Just some notes on the serious work that’s still going on. This whole thing was supposed to take a couple of months. It’s run 6 months beyond the time I expected it to already because I had no idea how hard it would be. But this shouldn’t matter in the long-run as the code will probably be in service for 60 years if it works. At the moment Adaptive Clearing doesn’t do any fancy links. If it can’t go nearly directly through the partially cleared pocket, it rolls off and does a retract to a roll-on to the next starting point. This doesn’t look great. Also, when we re-order the passes for better efficiency, we shred all the links that are any good and need another way of recreating them. I’ve been meaning to write up something about how we re-order the passes for a year, because it’s a really simple trick. 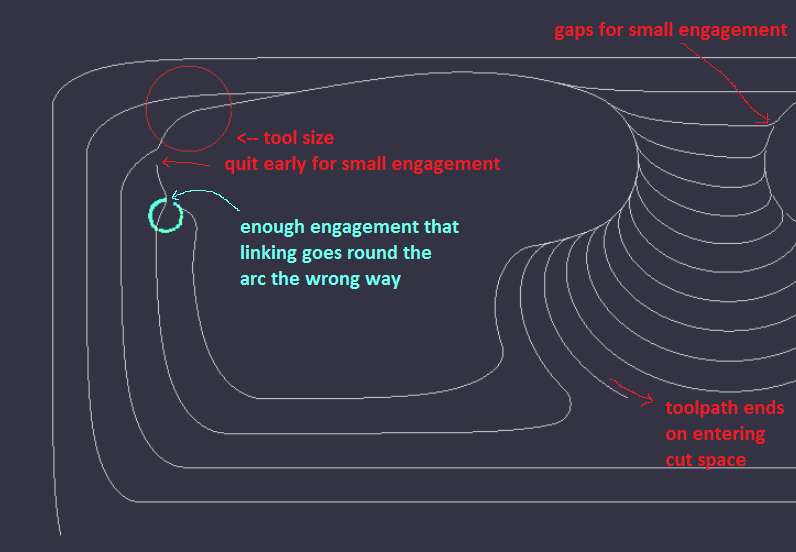 It’s unfortunate that it exposes this re-linking problem, so you don’t get the benefit. 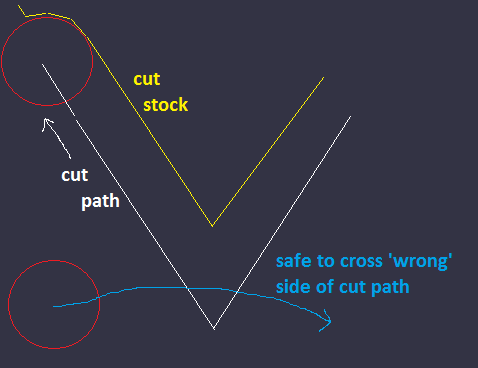 We’re going to get lots of questions about how it passes on the “wrong” side of the previously cut path. The diagram below should explain why it is correct. 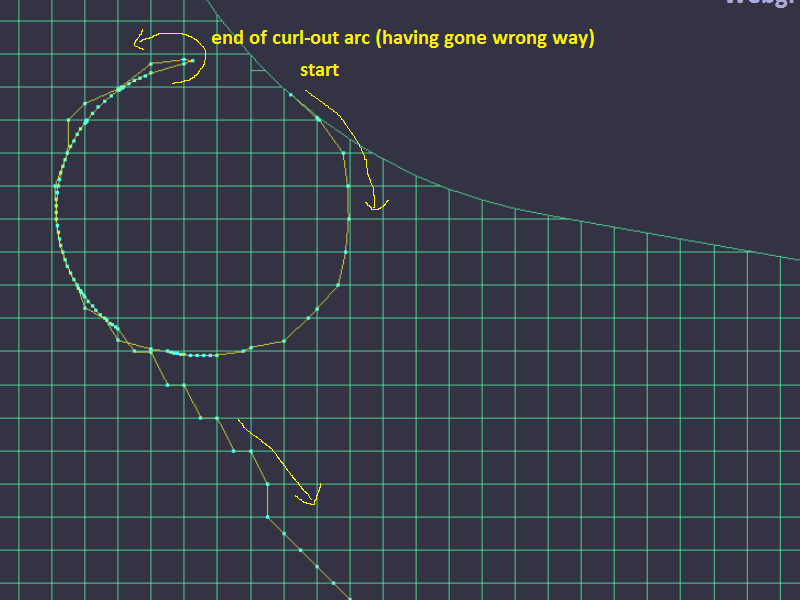 The real problem is that my linking path is going round the wrong side of the roll-off arc. It then has to back-track to find its way to its linking destination. Note how it zig-zags through the cells because re-smoothing is disabled. 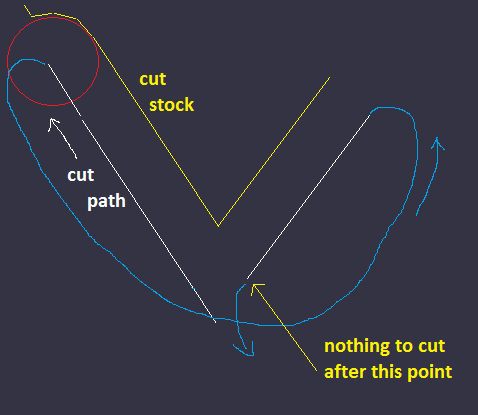 The problem is that the cutting cycle skips out sections when there is almost nothing left to cut. But my re-linking motions spots this material and tries to avoid it. Since there’s not enough room to get round the arc on one side, it goes round the wrong way. This small diagram shows how there is a lot less material there than it seems. But still, it’s non-zero, and I don’t want to include a tolerance here. So I’m going to try and barge through the start of the linking motion and splice it in some way. Not sure how to code it yet. Things keep growing more and more layers of unexpected complexity. That’s how it goes. Scored a bit of a hat-trick with a cave trip, hang-glide and dive in the same week. 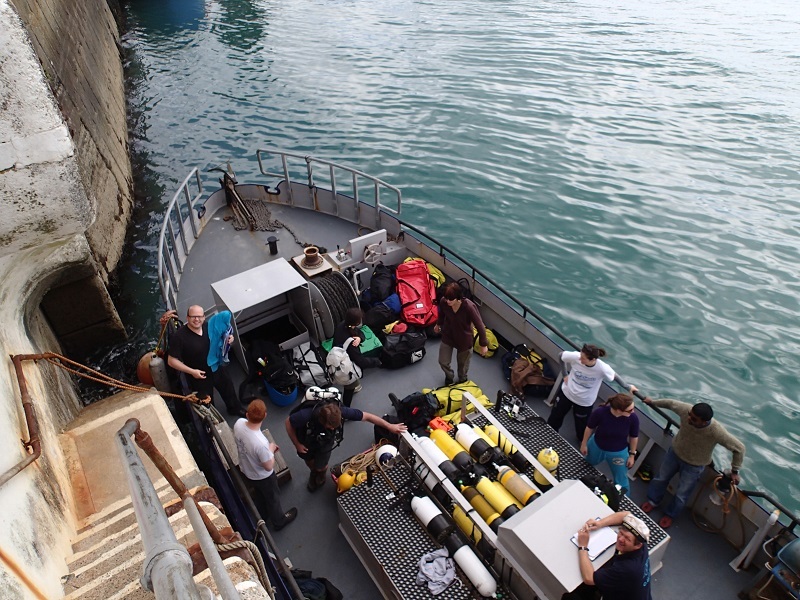 I had wanted to return to Rathlin Island this month, but following a quick trip to Cambridge a couple of weeks ago, we got invited to fill two spaces on a CUUEG trip to Pembroke with Celtic Diving on their enormous boat out of Fishguard. I thought the best dive of the weekend was on Sunday on the wreck of the Dan Beard, one of the Liberty Ships. 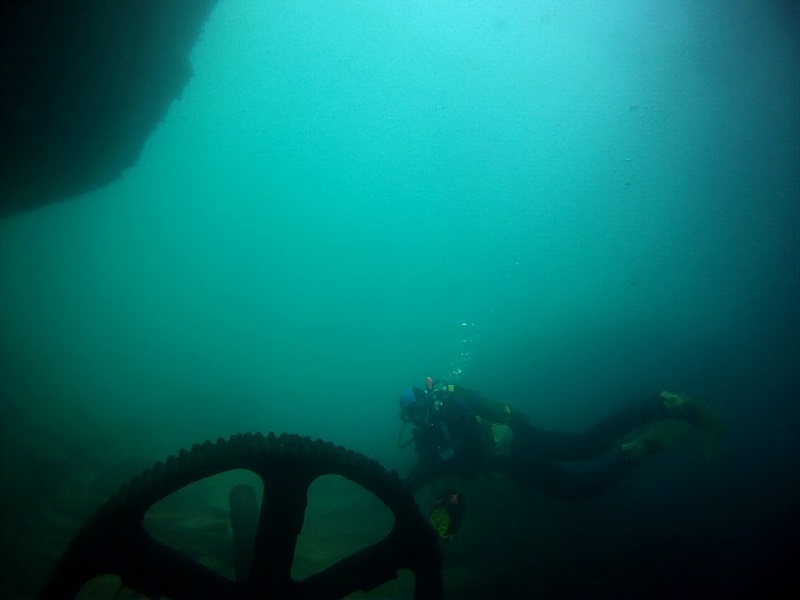 Quite shallow, but clean with lots of metal bits, shiny brass, cogs, gulleys, two dark caves and a seal encounter. This is a video edited from a couple of dives on the wreck of the Baron Ardrossan, which was more silty. The conditions were sunny, but with a northerly swell, which limited the dives to sheltered bays where the visibility would not be ruined. We stayed an extra night and went for a kayak diving paddle from Abereiddy (absolutely packed with coasteering and sit-on-top kayaking activities), out to Sledge Rocks near the wreck of the Musgrave to experience the choppy waters and a strong tide, then back to land for a crap dive in the next cove, before up-anchoring and doing the Baron Ardrossan again, skipping Porthgain, taking lunch on an island before heading in to Abercastle and failing to find the blowhole. It was a very long drive home, and I’m still quite tired. Should get back there soon as it has a lot of potential for more kayak diving to the east of Fishguard. The traditional method of landing in light or no wind calls for a sharp, aggressive flare at precisely the correct moment. This technique works fine when done correctly, but it’s not easy to get the timing just right. Flare too early and you will climb, and then fall with the nose pitching down. Flare too late and you won’t get the nose up enough to stop your forward motion, and the glider may nose into the ground as you run into it from behind. [We recommend] a combination of a “crescendo flare” and a run out of the landing… [B]egin your flare by smoothly accelerating the rate at which you push out on the bar. At the same time, draw one leg forward, put a foot down, and start to run as hard as you can. This run should be very much like an aggressive take off run – your body should be leaning forward into the run and you should be driving with your legs. The difference here is that while you are leaning into your run and driving forward with your legs, your arms are extending fully from your shoulders, pushing out, and what feels like upwards, on the control bar in an accelerating, “crescendo” flare. Ah, that old “traditional method” phrase, which means “doesn’t work”. Must use that more often in other applications. Sometimes we use the phrase “the classical method”. It strikes a political balance of telling someone they’re completely wrong, but they shouldn’t feel ashamed they were wrong because everybody used to do it that way. I packed up, began walking up the hill only to be given a lift by some paraglider who had driven down specially for me. Very kind. No one was flying yet. I fetched car, put glider on roof, drove back to top, carried over and rigged. The turn-around time was a little over 2 hours, which is about how long I estimated we’d need to wait on the hill for conditions to improve. 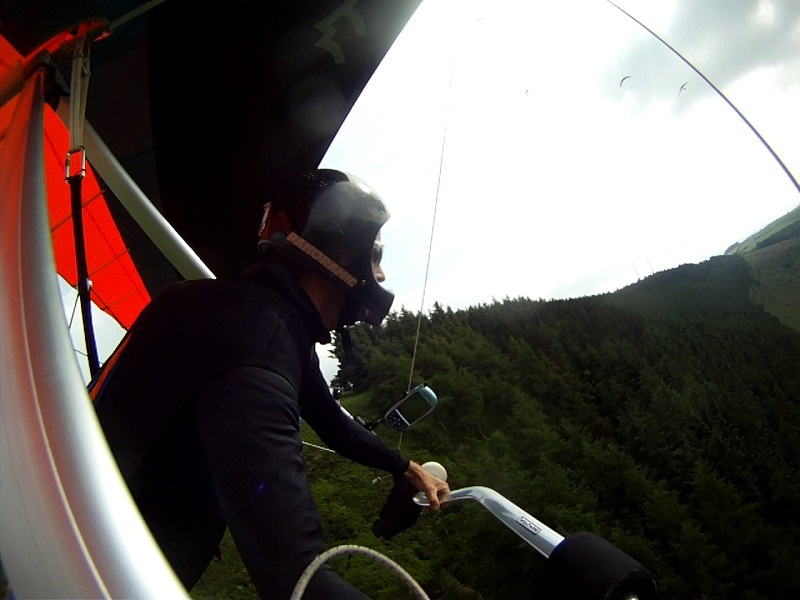 I saw the one visiting hang-glider into the air (another Sport 2), and then got away myself. 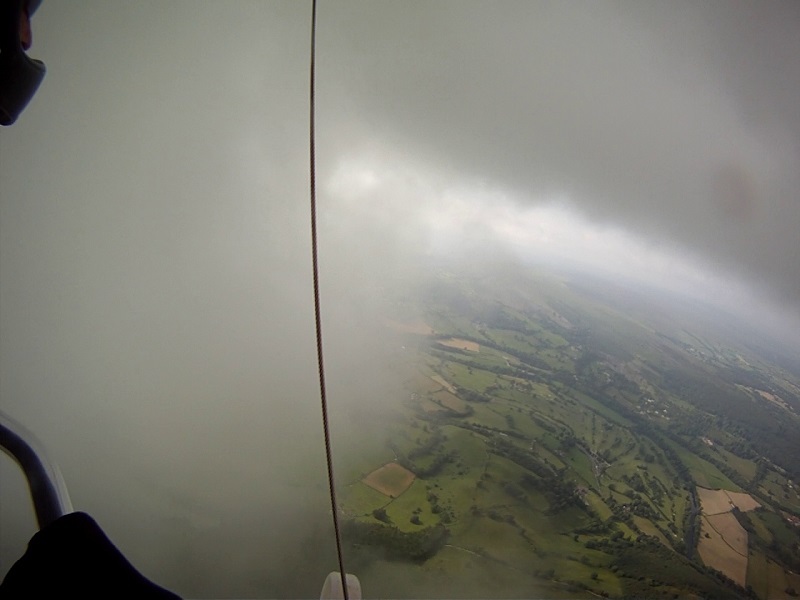 There was a low cloud-base with very weak thermals, but I got there. I even busted through one layer of clouds into a gloomy gap between them and was at the top of the stack for most of the hour. It was dreamy. Meanwhile, at work, we’re still mucking around with a year of improvements to Adaptive Clearing. 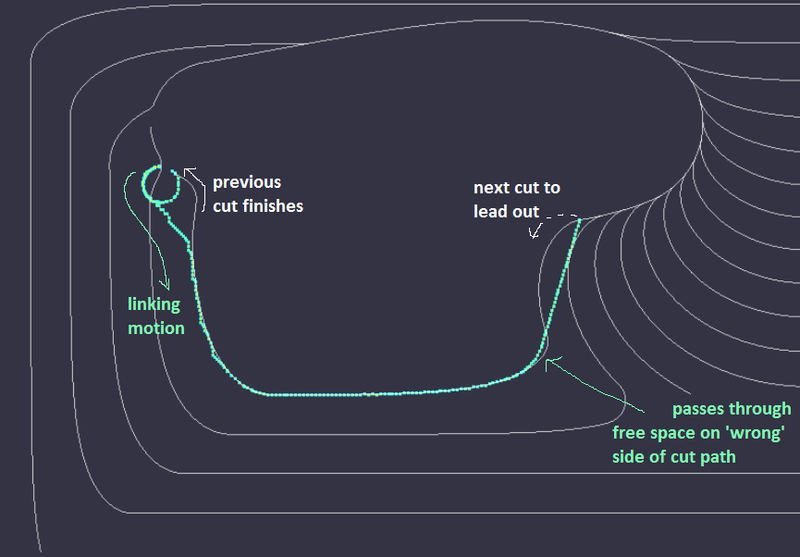 I remember I was going to do a little write-up on how we do toolpath re-ordering in Adaptive Clearing. It’s very simple, but probably more worthwhile to do when I’m no longer debugging it some of the problems created by it. Things just keep getting more complicated. Update: Here’s the quickly edited video. What’s been going on since I got back from Austria? Mostly working (for a change), washing up, catching up on stuff. After 18 months of agitation, I organized a Simultaneous Satellite Tech Summit in AD and managed to get 3 other people to turn up. The Tech Summit is a single 2-day conference between lots of the AD developers that takes place once a year in a hotel where everyone is flown in on expenses. Many of the talks are streamed on-line, so I thought it was a pretty obvious idea to hold a group watching event between the developers in England who were not burning lots of carbon to cross the Atlantic. This enables us to meet and interact in our local halls as people claim they productively do when they go to the real Tech Summit. After all, it’s more useful to form collaborations between the offices in the same country because it costs hardly anything to move between them and work on joint stuff. This proposal brought out all sorts of flimsy arguments against it about how face-to-face meetings are so much better for forming relationships that don’t take account of the fact that we are software developers. We’re quite good at working together when we can actually access the same source code, and it is often the case that when we do meet physically on a personal level we won’t like one another at all. Stop arguing, the managers said. It makes our ears hurt. But how are we supposed to change things without arguing? You’d think a company that employs so many computer programmers would have some sort of a handle on the psychology of computer programmers. I am not going to comment on the ScraperWiki newsreader event I went to in London, because I don’t know what to say. Anyways, that’s just work. 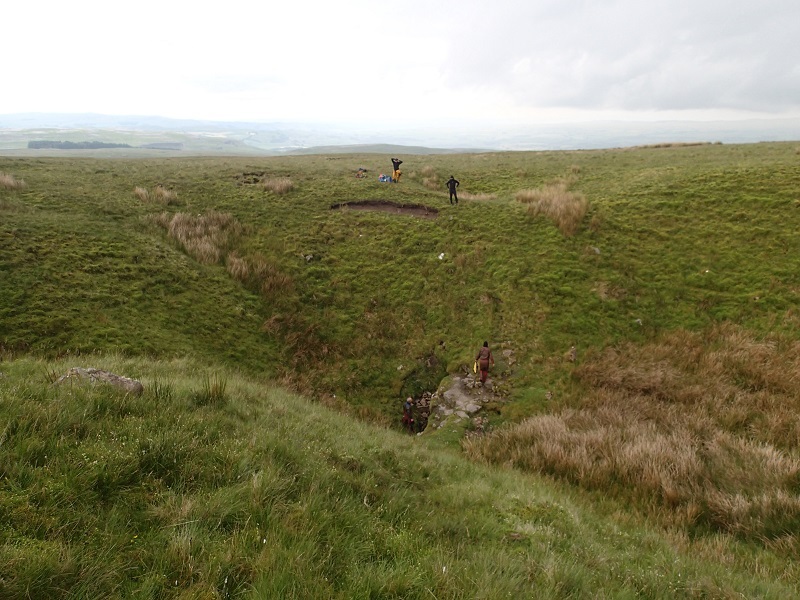 At the weekend Becka decided that I should go caving down Newby Moss Pot on Ingleborough as it was one of the ones she had not yet done from her favourite book: Not for the Faint-Hearted: 50 harder caving trips in Yorkshire. I can’t say I learnt my lesson, so much as I should say: suckered again! It’s just a midge-infested fleabag of a cave with tight squeezes that lead to nothing of interest. Against everyone’s recommendation, I did it in a wetsuit, which meant I fit through the tight bits a lot better than when I have rolls of PVC fabric around me hooking onto every bit of rock in those wormhole crawls. That’s enough of that. While Becka went on a quick trip down Penyghent Pot, I did a cycle tour of some of the Dales Hang Gliding and Paragliding Club sites over some of the region’s steepest passes. 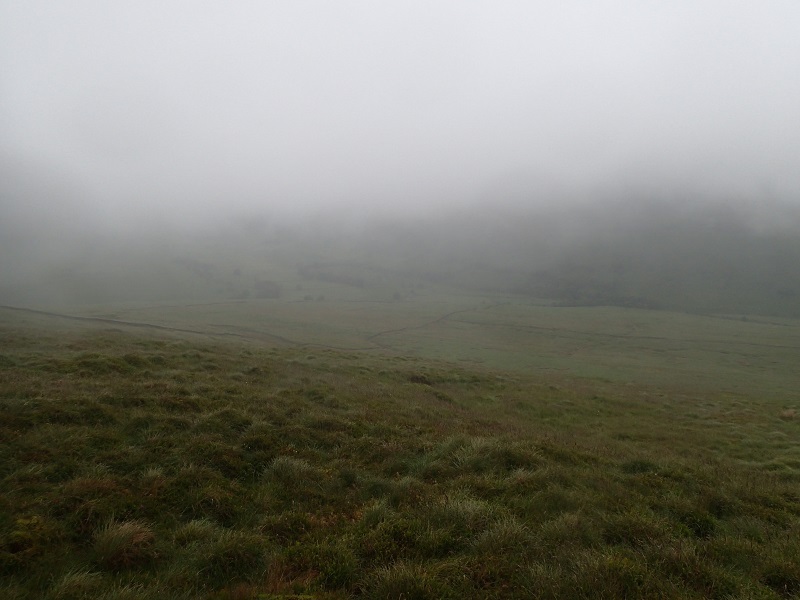 I got everything from my waist down saturated with water walking up Cow Close Fell. I’m not sure any hang-gliders fly there due to the carry up and the bottom landing field in the valley being embarrassingly small. It looks like it would be harder work than Whernside. Whernside takes a SE-E, and Cow takes NNE-NE. The other site I checked was Hawkswick which takes SW. This has a good track you could push a hand-truck up to the top and a good clean steep face to soar on. 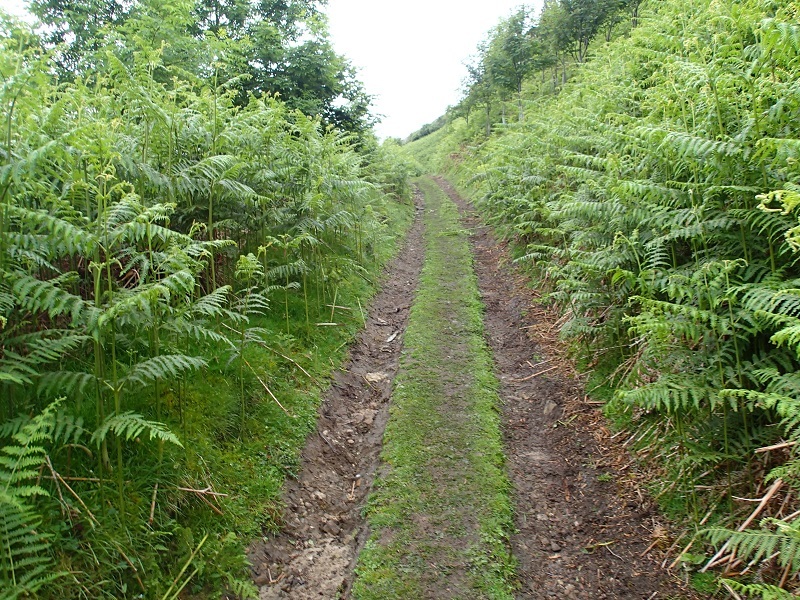 I got tired of pushing my bike up the track and left it partly hidden in the bracken on the left. When I got back it was gone! Along with all my valuables in the pannier. That was a bad moment. I found it parked against the wall down by the main road. Not helpful. I had no cream teas on the entire ride as there were none on the route. Becka and the others were already in the pub when I got back to the car in Horton. The trip back from Austria didn’t go quite so well. 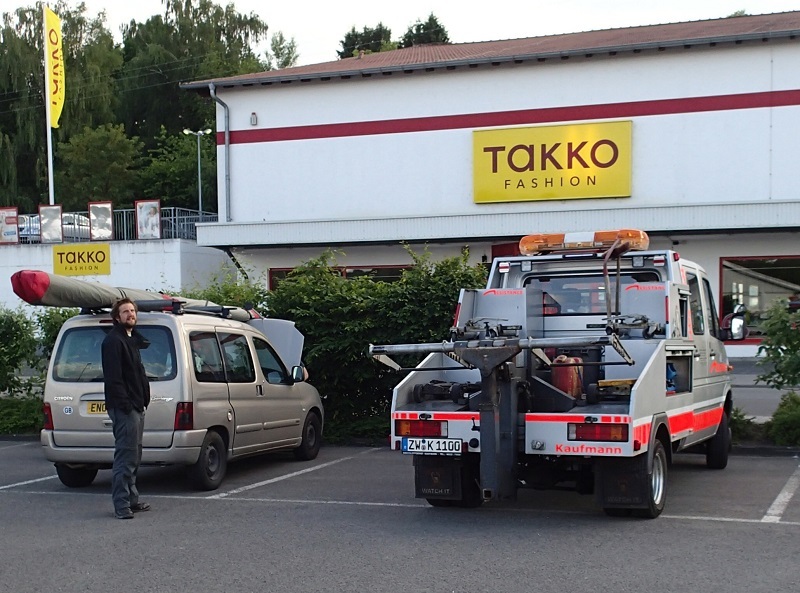 The alternator began to fail near Stuttgart, and we finally stopped at Zweibrucken when the exhaust got too noisy and fell apart. The rescue by the local Autodienst adkaufmann was quick. After reconnecting the alternator (which had also mysteriously fallen off at the same time), we gave the car a push start and drove it round to their yard where the exhaust was welded back together. Unfortunately, the alternator was no longer charging and it was Saturday in Germany, so no car parts were going to be forthcoming till Monday. We were deposited into a hotel. Zweibrucken was not very interesting, and our bikes were in the car. 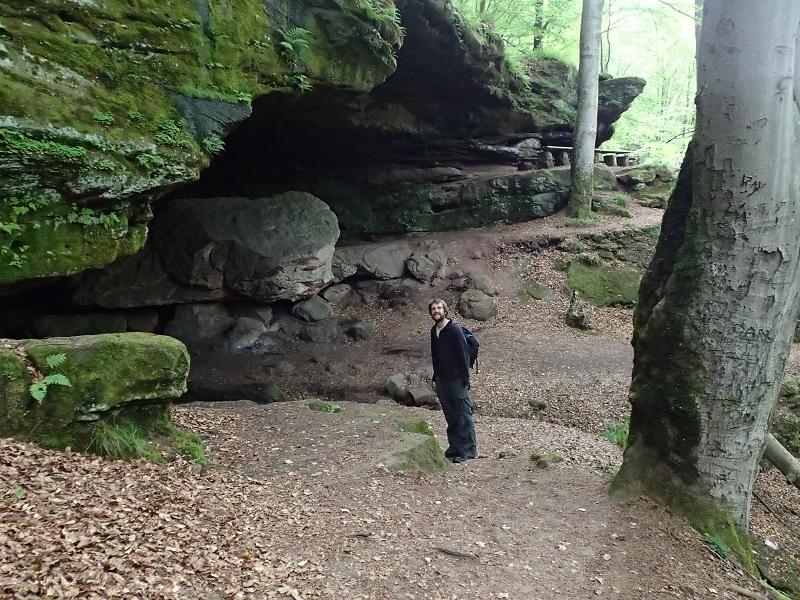 Tom read about the Felsen Wanderweg, so we caught the train to Rodalber and walked it, eventually finding the 40m deep sandstone cave. So, setting that business aside, here are the costs and benefits from my holiday. There were 11 days available in Austria from 20 May to 30 May and I flew on 7 of them to clock up 16 wonderful hours and 31 minutes flying time over 9 flights. We drove a total of 2600 miles and spent £300 on fuel. Ferries cost £110, highway tolls cost £40, food was £191, camping was £165, flight tickets, taxis and toll roads were £62, and I bought £26 worth of maps. To cheer myself up, here is a short video of the climb out from my duel with the dual glider.